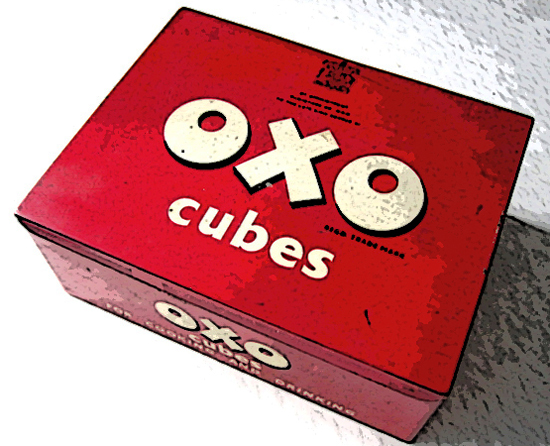 Tackle boxes part eight, the carpers Oxo Tin! The carp fisherman of the 1950’s had different requirements to the usual float angler, the Oxo tin was the perfect size to take a selection of hooks, numerous weights and spools of line. Just like the carp scene now, fashions prevail, so once the Oxo tin was seen in a few Redmire photographs the tin and specimen hunter became common place on the water’s edge for another decade in search of Leney’s. This season (2012/13) I’m trying the Oxo tin myself, aside from floats, it can take all my terminal items plus a torch and two bite alarms. My angling this year will be very much grab it while I can approach, one small bag, a net and a rod (maybe two). 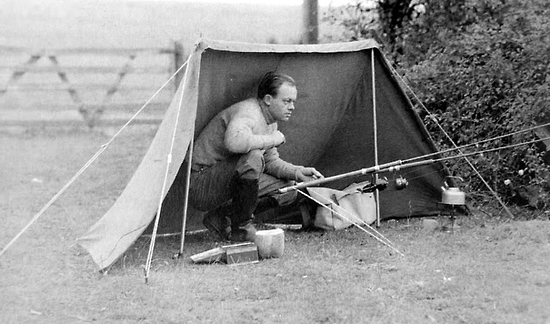 Gerry Berth-Jones is sited here with what I believe to be an ‘Oxo’ set up and a ‘Pup’ tent also an essential part of my 1980’s carp outfit. Pre sun-lounger stuff, I believe.